Another day, another clothesline full of fresh laundry in Crooked Tree Village. On a hot day, wet clothing dries in about an hour, sometimes less. And there’s nothing that smells like fresh, line-dried clothing. Moreover, it’s environmentally responsible, and on cold days, if you don’t have a dryer in Crooked Tree Village, don’t worry, even the winter sun is warm. 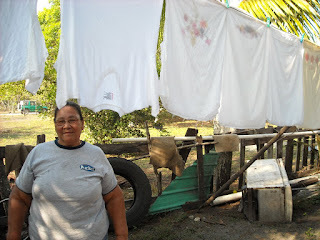 This courtyard is more than a laundry, its Ms. Yvonne’s private garden with beautiful flowers and her farm, full of all different kind of animals. I do love walking down the roads of my village and keeping an eye out for clotheslines full of fresh laundry. Very nice pic mom. We know you really like that apron, but it's time to say goodbye to it. You are the greatest mom a girl could ask for, very hard working woman that we look up to. We love you. Congrats on all of your hard work. We are so proud of you girl. Ms Chuny is very real in these pictures and it is a nice change to see someone in their own natural state. She didn't had to or want to get fancy. 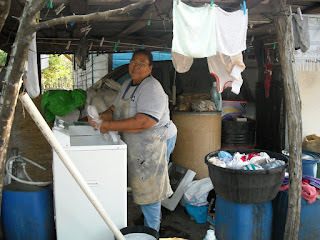 She is a very hard working woman and try to help other people. I remembered when my sister-in-law (Gloria Crawford) broke her arm Ms Chuny help her by making bread every Saturday. Bevy your Mom looks quite comfy in her apron and she would probably say that she just got it broken into. Thank you so much for the comment, Louise. My mom is always there to give a helping hand, can't say no, that's why I love her to death.